Hi everyone! 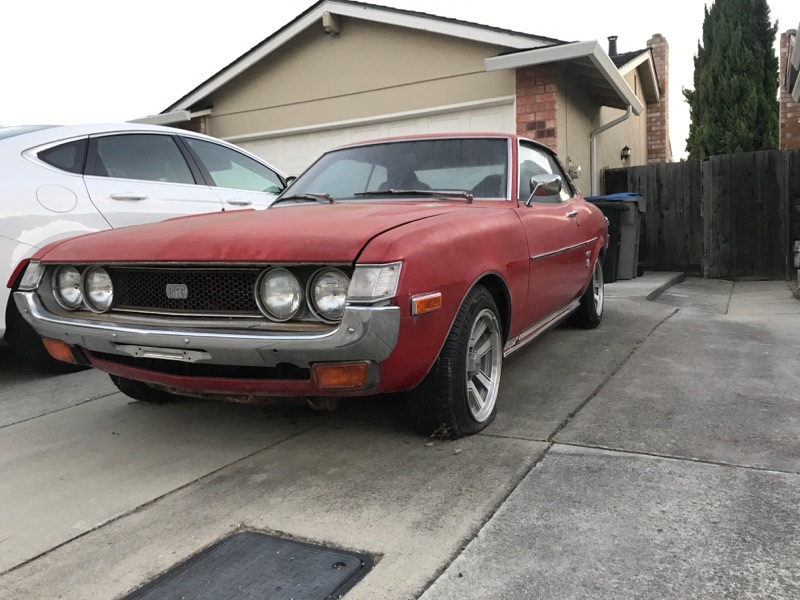 I just picked up a 1974 RA21 Celica GT project car. 20R motor, 5-Speed. A buddy of mine spotted the car in a driveway in San Jose, CA, and talked the owner into selling it to me. It's rough and needs some TLC, but looking forward to working on it with my 4 year old son as time permits (he loves cars). I've been a long time fan of the early Celicas. My first car was a 1972 Celica that was a hand me down from my grandparents, with only 30,000 original miles. The car from my grandparents was rusted out real bad, so my dad bought a clean 72 body and we swapped the drivetrain into it. (this was in 1989). Then I used the rusted car as a parts car. I wish I still had both those cars today! I have many fond memories of learning to work on cars with my dad and my friends on the Celica. My original yellow parts car ended up in a junk yard in Moss Landing, CA area in the late 90's. The red car was sold to an individual where I lost track of it. I think we heard this also ended up in a junk yard somewhere in the same area. Maybe one of you have seen them or own them now? If so I have a lot of history on them obviously. (Ouch! Makes me sick. I wish I still had this. Little did I know these would become rare and the parts hard to find). Anyways, glad to be part of the 1stgencelica community! I'm suprised you haven't gotten any replies yet so let me be the first to welcome you to the 1st gen Celica membership! I like reading stories of members who had a Celica back in the early days and have pictures that document it. I have yet to post my history pictures but I have owned my 75 RA22 Celica since 1985 and it has gone through about three major changes since I first bought it. The same happened with me and my two sons when they were younger so keep passing your son those wrenches cuz he will love you for it in the future! My older son is now studying mechanical engineering and is doing really good at it and my younger son will follow but in electrical engineering. Just wait till you let him shift gears for you as you drive and push in the clutch, the ssmile will be priceless and unforgettable! And try and get him the Celica Hot Wheels car, the red one comes in racing decor. Just the dad side of me showing here sorry about that. So if you click on the following link you can see my re-introduction then click on the link inside that post to read a brief history in my original first introduction. Welcome to the forum! You have a long history with the Celica. I'm sure the car will look great when complete. Just a comment on Speednturn's....Last weekend I took my 25 year old out for a ride in my 77 Liftback. Drove all over, around 25 miles. On the way home he says "Dad, I want to try driving the car." I said "Are you sure?" He said "YES". I said, well OK, but in a parking lot first. Before he tried I drove around with his hand on the shifter and my hand on top of his. After he got the idea, we went into a big empty parking lot and traded seats. I'm like, OH BOY I hope this is a good idea. I explain the way to drive, push the clutch, etc. So he starts to drive and I shift. We bounced around a bit from 1st to 2nd and 2nd to 3rd. After about 10 minutes in that parking lot I said Hey you want to go out on the road? He looked at me like I was nuts. I said go for it. So off we went. Within a few minutes we were driving on the main roads and he was shifting, with a little help from me here and there to get from 1st to 2nd (instead of 3rd where he wound up a few times). I gotta tell you guys, I don't know whose was bigger, his or mine. PRICELESS!!! Great stories, thanks! My 4 year old is a car nut, he was so excited when I brought the Celica home and told him that he and I would be fixing it up. Should be a lot of fun and I hope to build some of the same type of memories as I had with my dad doing the same thing. Oh I bet you will. Enjoy it because that 4 year old will be 24 before you know it. I may know who you got this from. Waiting to see if he sold his 74 GT. dsp979 wrote: I may know who you got this from. Waiting to see if he sold his 74 GT. Let me know if it's the same person. I didn't actually meet the seller, a friend of mine handled the sale for me since the car was in San Jose and I'm in southern California. Yup, I know who you got this from. He said he didn't really have time to work on it. Very cool! Im in the san fernando valley working on mine at the moment, in sylmar to be exact (40 miles away from thousand oaks). 72 Ra21. 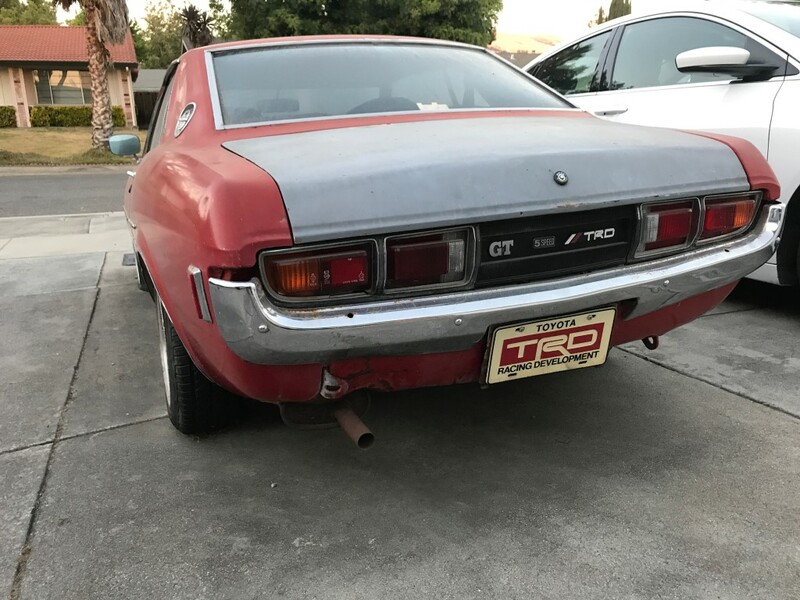 Cool to know theres a celica not so far away If you're interested in having flat lights like your previous 1972 cars send me a pm, I have a set but they're not perfect. Cool! Yeah I had heard he just didn't have the time, I'm very grateful he was willing to pass it on. My son and I are having a lot of fun working on it. Tell him thanks! Quis wrote: Very cool! Im in the san fernando valley working on mine at the moment, in sylmar to be exact (40 miles away from thousand oaks). 72 Ra21. 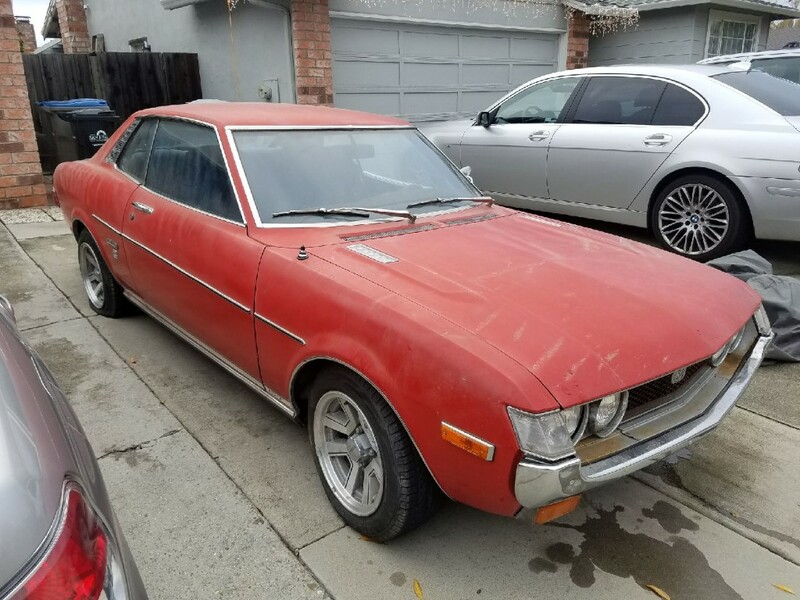 Cool to know theres a celica not so far away If you're interested in having flat lights like your previous 1972 cars send me a pm, I have a set but they're not perfect. Ohh wow, yeah you're not too far at all! I'll send you a PM about the lights, thanks!